Joe Perry is now the third member of Aerosmith to release an autobiography. Following in the footsteps of vocalist Steven Tyler and drummer Joey Kramer, Perry enters giving his view and take on the tumultuous career of America’s greatest rock band. This book will be extremely hard to put down once you crack it open and start to read it. A must read for any fan of the band whether you are a diehard or a casual devotee. The book starts off with Perry talking about his youth and upbringing. It continues on in chronological order and takes you through the origin of Aerosmith. It’s all here the drug indulgence of the 70’s, Perry leaving the band, the formation of the Joe Perry Project, the reunion and comeback of Aerosmith all the way through the current day. While many of the important events of Aerosmith are mentioned about throughout, there were a few areas that lacked more detail. It would have been nice to see more about The Joe Perry Project mentioned as Joe kind of just glosses over the three year period (1980-83) making it all seem like a blur. Also not much is mentioned about Richie Supa and John Bionelli both of whom have played essential roles in the band’s history. Overall Perry does a fine job delivering things from his point of view. It comes across as an honest read, one that will really take you inside the Aerosmith camp and make you almost feel like you were there. Rocks- My Life In And Out Of Aerosmith is easily the best rock book released in 2014. As co-founding member, principal songwriter, electrifying lead guitarist and co-producer of Aerosmith–America’s Greatest Rock & Roll Band–JOE PERRY has achieved permanent iconic stature in the pantheon of rock. He has helped to drive his band, over the course of four decades, to sales of more than 150 million albums, critical acclaim, four Grammy Awards and induction into the Rock and Roll Hall of Fame. PERRY’s work with Aerosmith has resulted in an unending array of accolades and honors. In June 2013, PERRY was inducted into the Songwriters Hall of Fame at the organization’s 44th Annual Induction and Awards Dinner. 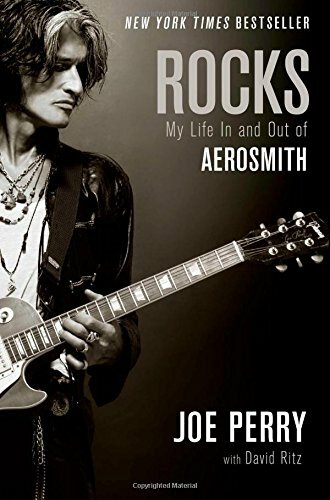 October 2014 saw the release of PERRY’s first book ROCKS: My Life In and Out of Aerosmith, which debuted on theNew York Times Bestseller list at #8. Throughout the book, PERRY reflects on his career with Aerosmith and his life as a musician, husband and father.